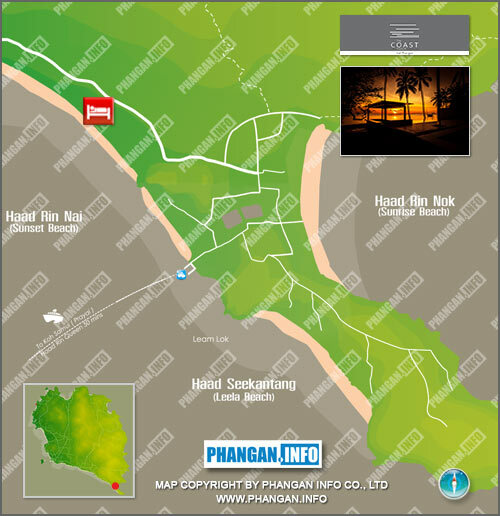 The Coast Resort is convenient situated at Haad Rin Nai Beach, approximately 10 minutes walk to Full Moon Party or Haad Rin Beach. The hotel is fairly close to the walking street where you can find all the shops, restaurants, bars and party scenes; yet distance enough to give you a peace of mind from staying away from the crowd. Haad Rin Nai Beach is a sunset beach so if you are a sun downer, come stay with us and get your first glimpse of the sunset sky with the cold drink in your hand.